Ahh Wollongong.. AKA ‘The Gong’. If you asked the bulk of people from big brother Sydney up the road, they probably wouldn’t give it a glowing recommendation. Traditionally it’s an industrial city founded on the furnaces of coal and steel. Not typically where you would go to find great food, coffee, sophisticated nightlife or a bunch of fun innovative activities to try. I was also one of the nay-sayers. But having devoted 36 hours in Wollongong last weekend I’m now a advocate for this great beachside city. 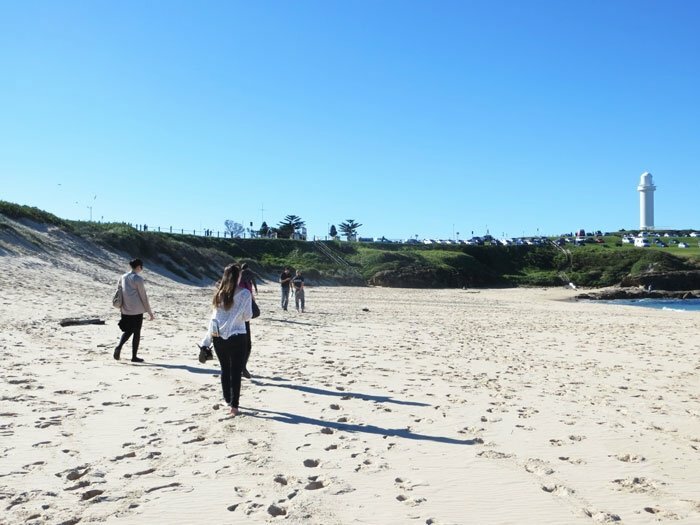 Come with me on an enjoyable and surprising Wollongong Weekender. I can remember back when I was about 12 and a huge basketball fan that I longed for such a place like this to exist, a huge indoor space with a floor made up of trampolines and a basketball hoop so I could fly through the air and dunk like Jordan, Barkley and my other heroes at the time. A decade or so later and my prayers have finally been answered in Wollongong. Hangtime Trampoline Park, is a paradise for those young and old who like to live life with their feet off the ground. 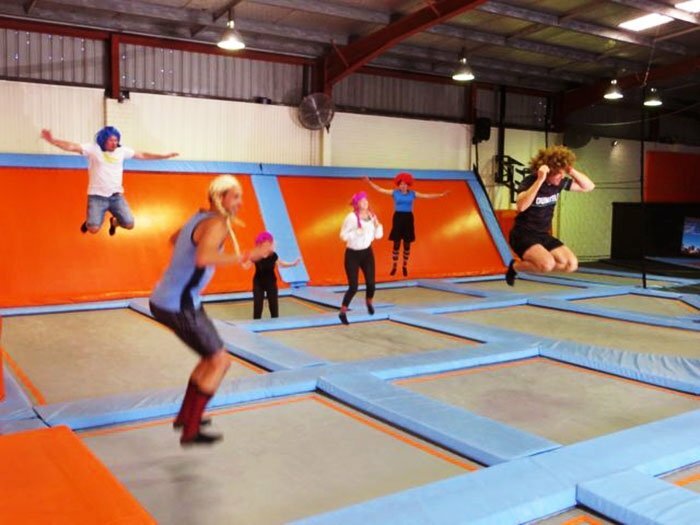 With over 20 trampolines making up the floor and walls of a warehouse, you can bounce around to your heart’s content as if you were an astronaut exploring the lunar surface. 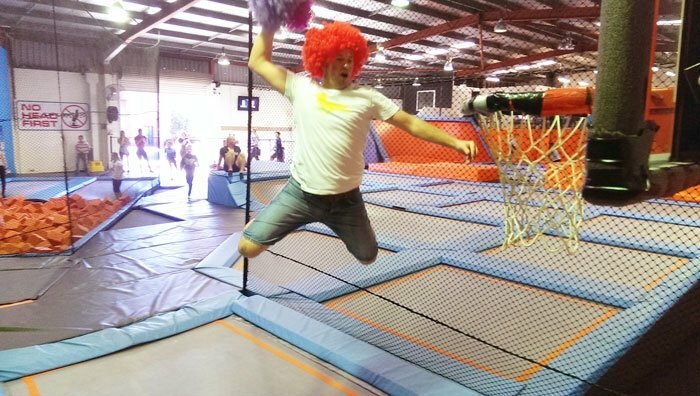 If you want to take your bouncing to the next level, then find your aerobatic wings on at the foam pits. Two springy trampolines launch you off into a 5ft deep pit filled with over 3000 chunks of foam. This gives you the opportunity to give your Mathew Mitcham impersonation a go. Feel free to attempt that triple backflip with a few twists and pikes as you will end up with a soft and harmless landing in the foam. Next level up in difficulty is The Walls. These 1.8m and 2m high walls are placed next to two extra bouncy trampolines, giving you the opportunity to run vertically up the walls or even see what it’s like to launch yourself and land on top of a barrier much taller than yourself. This is not for the faint of heart either and our coaches for the day made what is a skilful and scary experience look easy. But give it a go yourself and you will likely find it challenging. Finally, the part I has been looking forward to the most, realising the childhood dream of gliding through the air from the free-throw line and slamming it home on the basketball ring. The dream of cause made possible due to the springboard off the trampoline below me. The dream was also very different in reality than in my head. 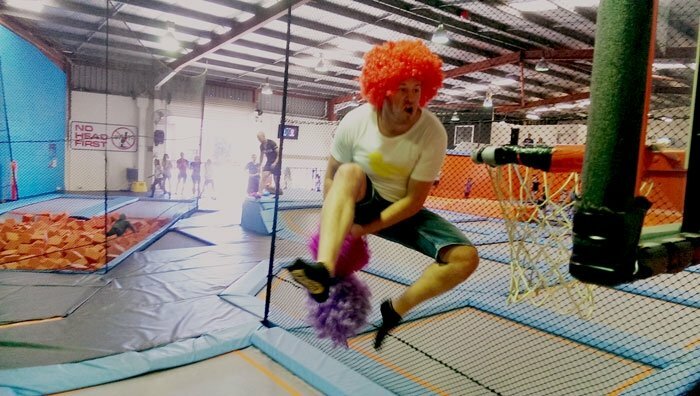 At the recommendation of our Travel Massive leader Bryon, I donned a bright red curly wig, so bring that could possible be mistaken for a traffic light… oh and the ball I was dunking wore a purple wig. A strange scenario but the picture (below) was still dynamic. Childhood dream coming true. I can finally dunk! As Destination Wollongong has invited a bunch of social media loving travellers to their city, it was very wise of them to arrange an Instagram walk around the city and get a bunch of ‘Gong inspiring images. Here is where I started to receive my first positive surprises about the “city of innovation’. Surprise 1. The city is full of amazing street art. Grey old flat faceless ugly walls. Wollongong appears to have more of these than most cities. So what do you do with them? 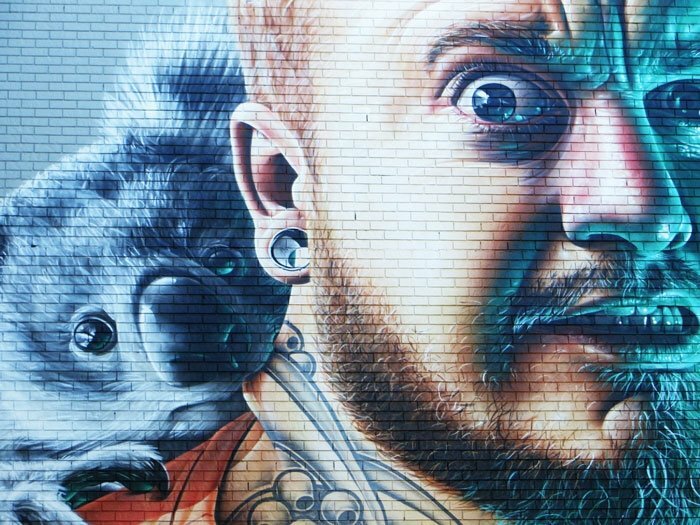 Answer: Get some of the world’s best street artists to brighten them up for you. This happens annually in the Wonder Walls festival. 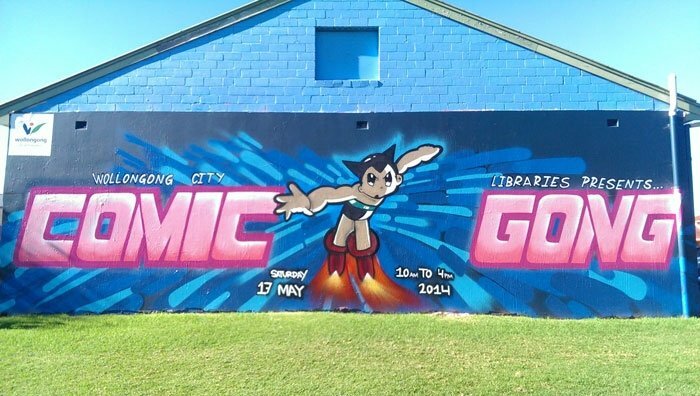 The first piece here (below) is used to promote “Comic-Gong” comic book convention, and this space on the back of some prominently placed public toilets is regularly changed to promote local events in the city. Next up this almost photo-realistic piece from UK based Australian artist Smug. Yes there is a Koala bitting a tattooed gum leaf on the that guys neck, causing many of us on the tour to conclude that these were in fact drop bears and not Koalas. A closer look, the detail is sensational. Surprise 2. Lane way boutiques, bars and cafes. 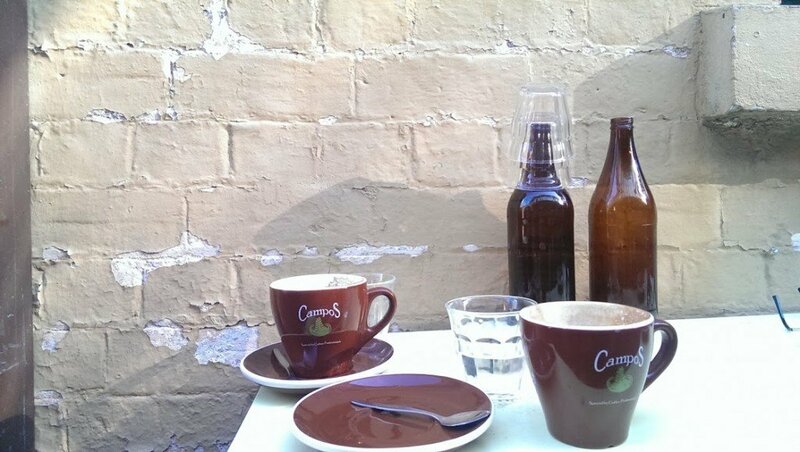 On more than one occasion I found myself pinching myself that I could’ve been in Melbourne. Down Globe Lane for example is the very charming, His Boy Elroy cafe. 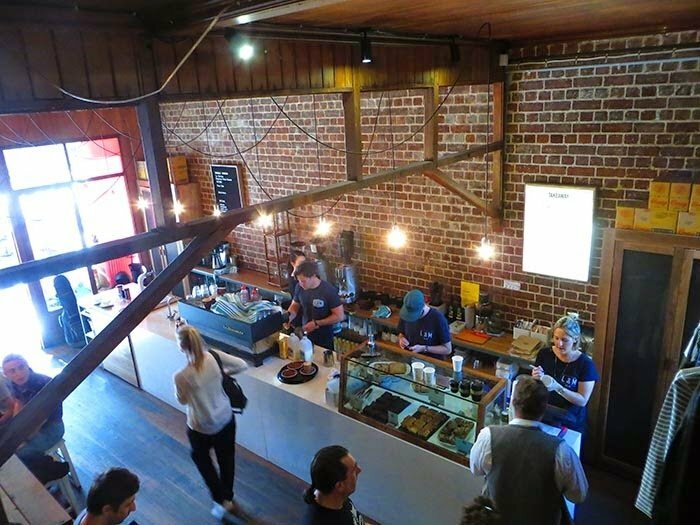 If you can find it you will be rewarded with a warehouse style fit out, smiling staff and of course epically good coffee. I should also mention the whole mall and lane way area’s are covered with fast and stable WiFi should you have the desire to surf while you sip. Not a surprise but still great – The beaches and harbour. 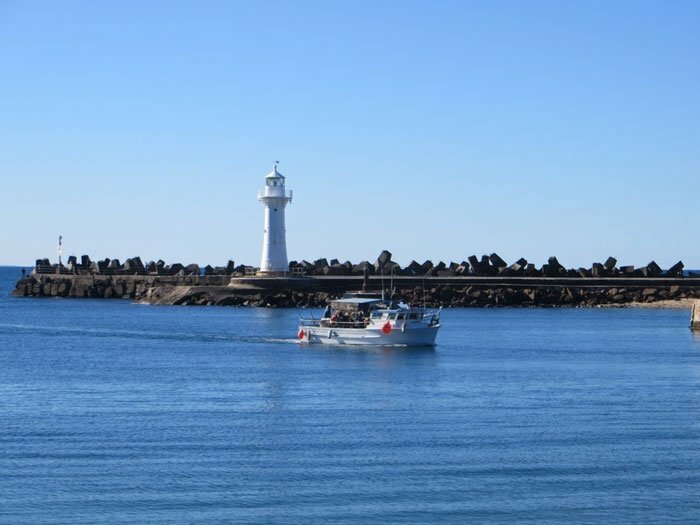 The Blue Mile is a walk and cycleway and is your “yellow brick road” to discovering the best of Wollongong’s oceanside waterways. The Blue Mile is an oceanside walking path and is well signed to ensure you see the highlights. We were lucky to have a bright sunny day. These pictures were taken in the middle of winter yet people are sun-baking in their bathers and braver ones going in for a swim. The historic lighthouse is the jewel in this crown. Head up to the base of its perch on the headland for a great view of North and City Beaches plus Wollongong Harbour. 1:30pm Mediterranean Lunch in the Former Men’s Change Rooms. Northbeach Pavilion was our home for lunch and also our home for an authentic Italian dinning experience. The restaurant has taken up home in what used to be the beach change rooms, but has been modified to take advantage of the ocean front view. The old sandy showers have been removed. In their place is a fine dinning experience run passionately by hosts Mimmo and Massimiliano. 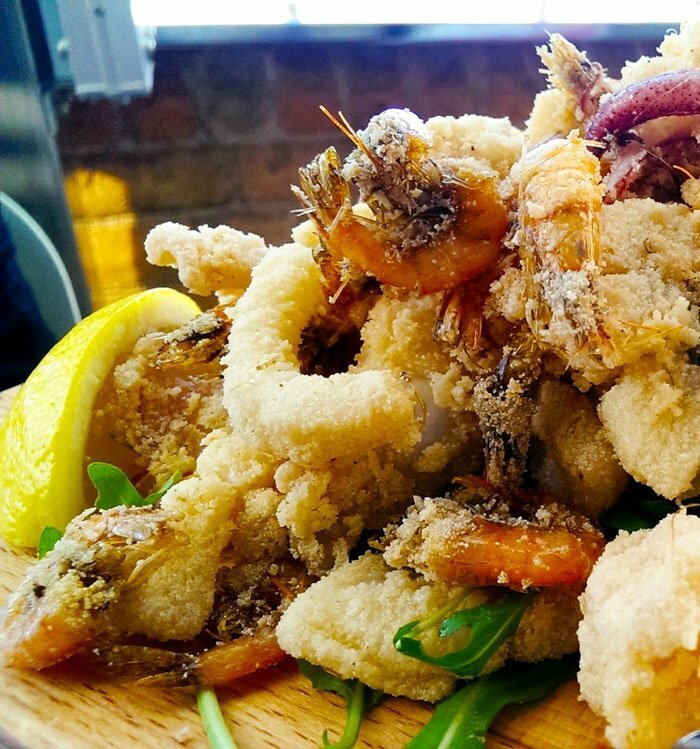 Famous for its pizza and seafood, and that is exactly what Northbeach Pavilion served us up. The Frito Misto was fresh and divine, and as someone who doesn’t normally eat seafood, I had no issues getting tucked into this. But perhaps the most impressive was the metre long pizza. The pizza features buffalo mozzarella and tomatoes imported from Naples so that Northbeach Pavilion can be officially accredited as serving Neapolitan style pizza. The pizza divided into 3 flavours was not what you will find any your local Domino’s instead it was brimming with the finest ingredients including black truffle. Bellissimo! 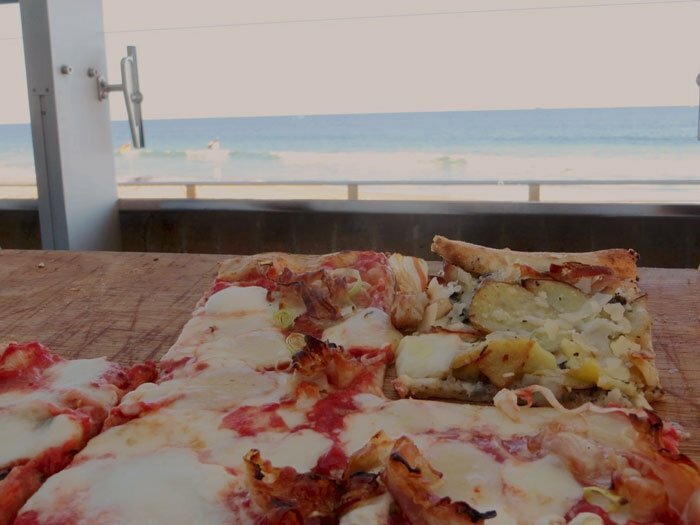 Pizza comes with a complimentary beachfront view. After a quick freshen up at our Apartment hotel Adina Wollongong, it was time for the evening’s festivities to begin. First stop, Howlin’ Wolf Whiskey Bar. The small bar scene has really taken off all over N.S.W. 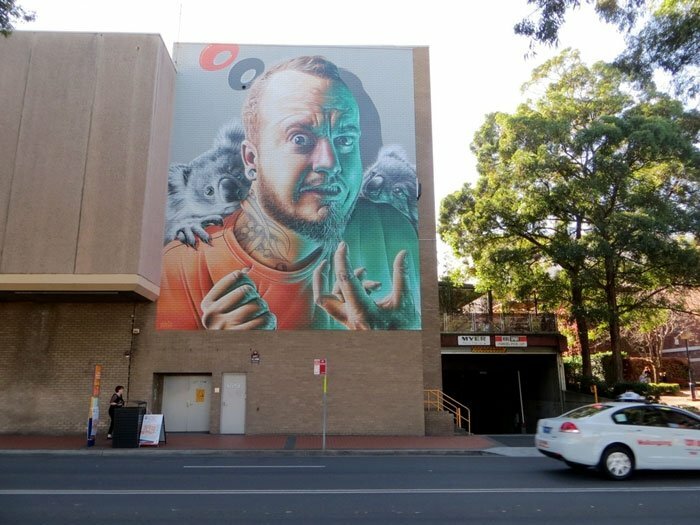 and this one we found deep in Wollongong would be very much at home in the Sydney inner city neighbourhoods of Surry Hills or Darlinghurst. 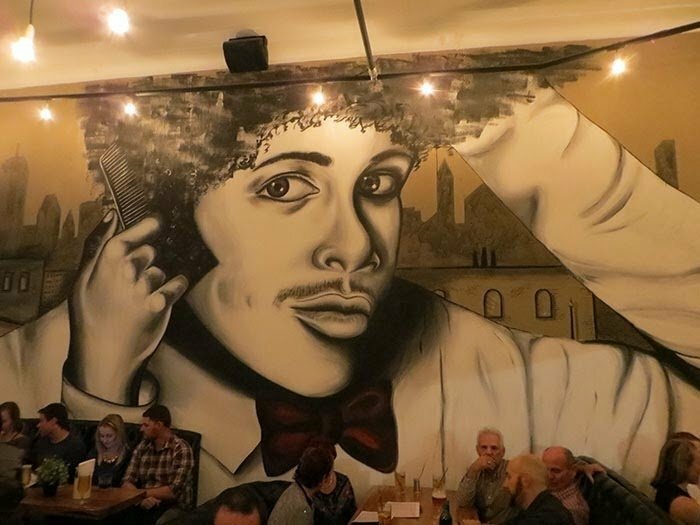 Howlin’ Wolf has all you would expect from a top-shelf bar – a wide variety of original cocktails made with care by experienced bar tenders, and a selection of antipasto and cheese plates that are to die for. Do not go and order a Mojito or Martini (although they are great), instead delve in head first to some of the house created specials that you won’t find anywhere else. If you can grab some of the smoked cheese of the anti pasto board your tastebuds will thank you. 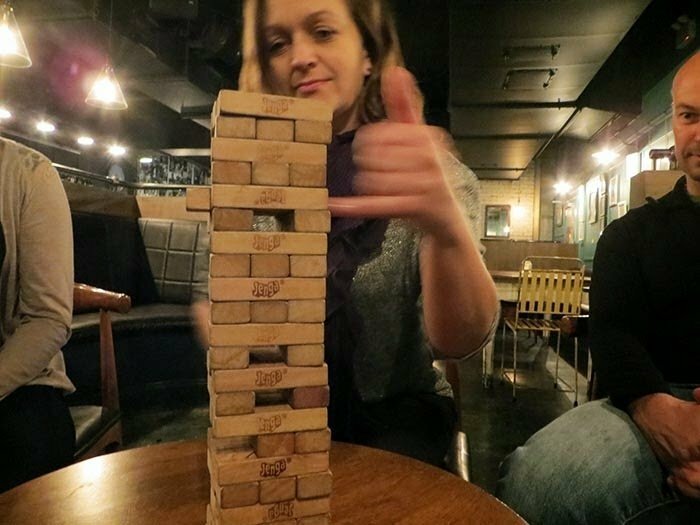 Should conversation with your drinking buddies start to whither, there’s games such as Jenga on hand to keep everyone entertained. The Whiskey Bar is not a name. The back-shelves are populated with over 100 of the world’s finest and rarest whiskeys. If you want to try something a little different then ask your bar tender to recommend you one of their fine Japanese whiskeys in stock. Something you won’t find at your local bottle-shop. 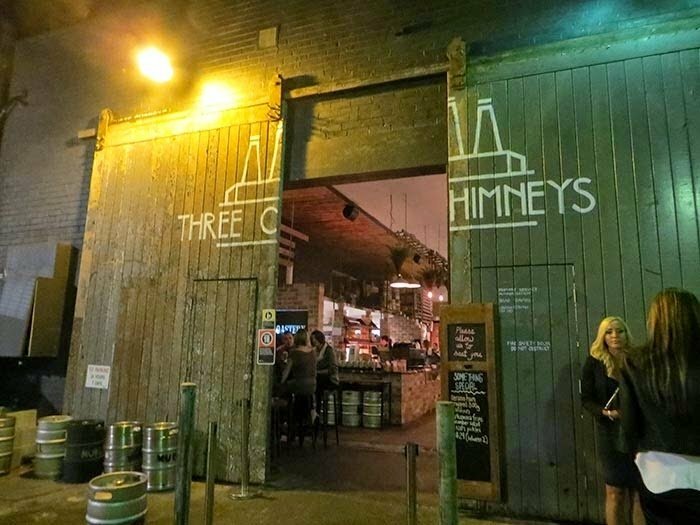 Three Chimneys – Dinner, Drinks and Dancing. There is one new venue that has taken the Illawarra by storm and that is Three Chimneys. It’s hard to explain what this venue really is, but take the atmosphere of a warehouse style small bar, the coffee and produce of a whole-foods cafe (There is a wood-fired sour dough bakery on-site, and they source single origin coffees from PNG and Ethiopia), a menu stocked with ‘Mod Oz’ sharing plate delights, and then top it all off with the craft beer choice of an Australian beer festival (all on tap by the way) and you’re on your way to picturing this gem of a venue. 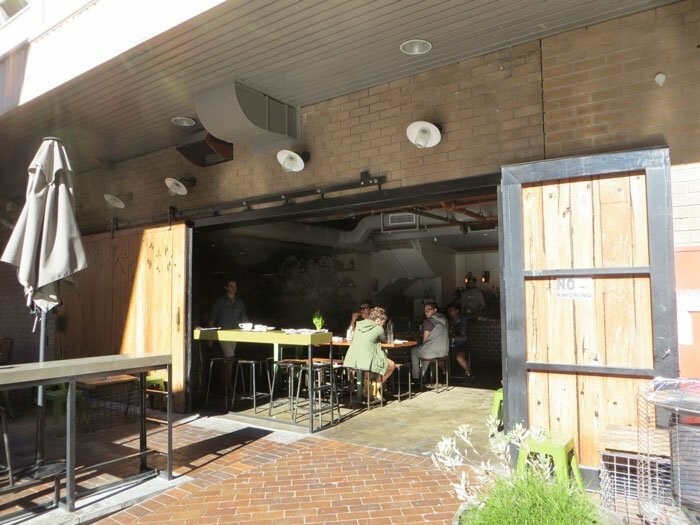 In true “hipster style” Three Chimneys is tucked away down a back alley behind the Illawarra Performing Arts Centre. Massive wooden sliding doors stand proud at the entrance. These doors, by the way, have been taken from Wooloomooloo Wharf and date back to the mid 1800’s. Once in side you are greeted with an industrial style decor with a full length mural down one of the side walls that would not be out of place with the Wonder Walls street art pieces we’d seen outside. A closer look at the wall length mural. We came for dinner – 6 courses of cuisine a mixture of Mexican, Indo-Chinese and Australian all tastefully combined into classics like pies, wraps and sliders. – but we stayed to dance. 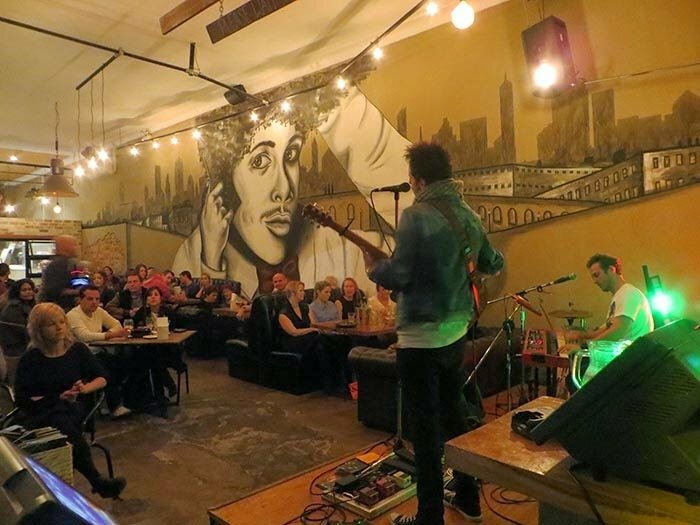 A live band got the crowd out of their chairs with a mixture of covers and originals of modern hits done in their own unique style. 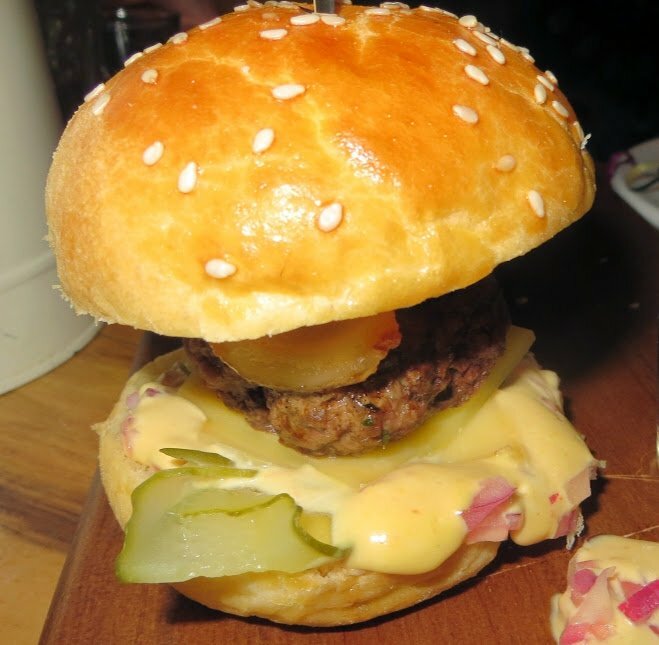 Duck meat slider with chipotle mayo and pickles.. I could’ve eaten millions of these. If dancing is not your thing they are open from 7am for fresh coffee and even fresher treats from their on-site wood fired bakery. The night was spent in the spacious apartments of Ardina Wollongong. The sauna and heated pool was just what was needed after a long day marching the streets of the gong. The apartment hotel is centrally located a couple of blocks from the beach, the city centre and the Entertainment Centre + WIN Stadium complex. 10:00 am Sunday. Morning coffee at Lee’s house. Lee and Me (also known as L&M) is our destination for Sunday morning’s caffeine hit. Walking into the 1890’s terrance house you could easily be forgiven for going back in time, but the coffee quality is definitely modern day. Lee and Me serve Campos Coffee and for the health nuts (like myself) even offer the chance to have it with almond milk instead of the regular dairy or soy. Lee & Me, set in a heritage terrace house, has a very homely feel. The heritage nature of this place is most evident when you head upstairs. Rooms that was once the bedrooms now host racks of clothes for sale from the onsite boutique. Keep exploring upstairs and you will find the sunny north facing balcony to enjoy your coffee or food. With all original walls remaining and a shower still in the restroom, you really do feel like you’ve stepped into have coffee in someone’s actual house. 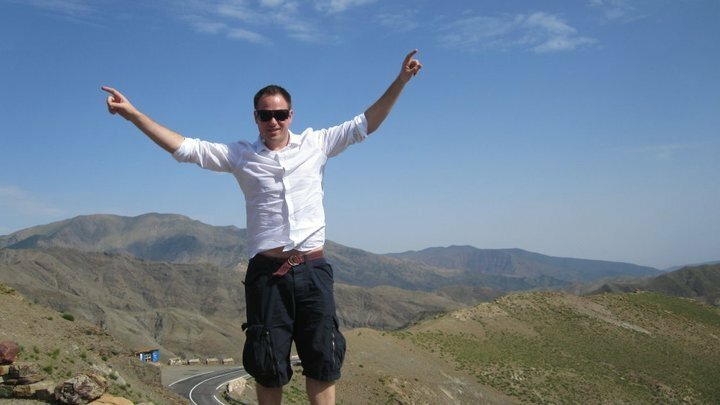 The staff will also make you feel just as welcome as if visiting a friends home too. If you are driving between Wollongong and Sydney (or vice versa), I strongly urge you take take the Grand Pacific Drive scenic route. Heading up from Wollongong you will pass through charming sea-side towns such as Bulli, as the road hugs the coastline and even goes over it at the Sea Cliff Bridge – a remarkable feat of engineering the bridge is curved and runs parallel to the coastline – before hitting heritage sites like the Scarborough Hotel and onwards into the leafy Royal National Park. It’s a leisurely drive and much more interesting and educational than the main freeway further to the west. The route is also extremely well signposted so do not worry about getting lost. Even if you did get lost this place is paradise so maybe not such a bad thing. Below- a HD video journey over the Sea Cliff Bridge. Regular trains depart Sydney for Wollongong from Central Station up to 4 times an hour. Adult tickets cost $8.60 one way. See sydneytrains.info for more information including timetables. 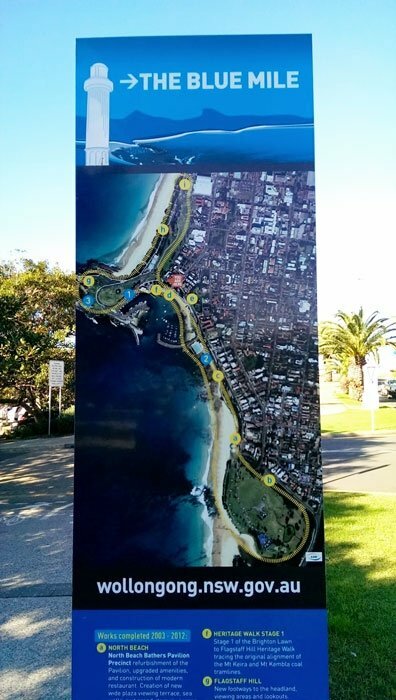 You can drive to Wollongong by heading south on the Princes Highway or follow the road signs down the Eastern Distributor (M1) past the Airport to Wollongong. This trip was organised by the Sydney branch of Travel Massive and the amazing people at Destination Wollongong. I thank you both for inviting me a long. This entry was posted in Oceania, Travel and tagged Australia, bars, beaches, Coffee, New South Wales, NSW, travel, whiskey, wollongong. Bookmark the permalink.